A few weeks ago I posted a question in the project guidance forum but never received any feedback. Thought it might be the wrong place so I give it a try here instead. My goal is rather simple. I want the Teensy to respond to a frame when its detected on the bus. But I don't know how to implement it with the help of the FlexCAN library examples. I have a Teensy 3.6 and a CAN transceiver module SN65HVD230. Listen on CAN bus for certain frame. If frame == "t568101" detected..
send on CAN bus "t5653001511" in decimal format. Have anyone done something similar and can post an example snipped of code? It’s definately possible to do, a received frame ID would update the msg.id with the CAN ID of the frame. But what do you mean frame id is “t568101”?, that is not valid, are you looking at the data field? Thank you for taking time to look at my project tonton. 101 = payload in hex. Thank you. Looking at your library now. So what I need to do is create an IF statement on the content of msg.id variable and msg.buf[x] compared to the ID and string I'm looking for? I have now done some dumping on the bus with the following code, which is an altered version of the test code supplied with the library. ok what you can do is for example ignore the hexdump() call in loop and access the data directly. inMsg.buf[x] is your 8 data bytes, where “x” is the indice 0 to 7. How do I read the date without going thru hexdump? And what is hexdump actually doing? Ok! Let me experiment a bit and see how I go. I have experiemented a bit more and being able to detect the frame ID which is great sucess. Now I want to detect the content of the frame and respond with a CAN message as well. 14:35:02.786 -> 1384 FRAME DETECTED! Another thing I cant get my head around is how to format the outgoing CAN msg. Shall it be in HEX or DEC? Depending on how I read the CANbus with different tools and settings, the same CAN msg shows up in different formats. These are the same frames in different format. And the frame ID can be both 569 and 1385 depending on if its HEX or DEC. Thank you. Does this mean that the library accepts DEC as standard when populating the msg.id and buf? this is normal accross all C/C++ programming. You live, you learn. Thanks alot for your quick replys! I've learned a lot during the last few days and its getting really fun. With the following program I've made, I have been able to print in both DEC, HEX and BIN to serial console. This to give greater insight to what is happening on the bus. But, first and foremost the serial print in BIN format gives me a bit of grief because it leaves out beginning zeroes, which makes it hard to read which 1 and 0 belongs where on the payload. Red = DEC, Blue = HEX, Green = BIN. You can see the bytes that is just one "0" instead of "00000000"
Secondly, I have found that the nodes on the CANbus is packing multiple data into one byte. This is where the BIN readout comes in very handy. With this I have verified the following. 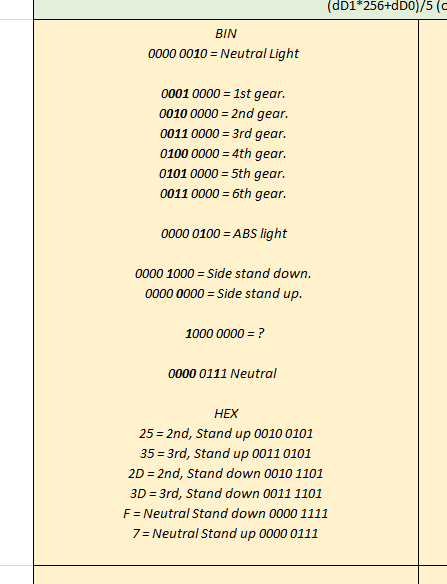 from the CANBus frame "10101000000 00100101 101100 1 0 0 0 0 0"? From my table above, this frame means ID 1344 (DEC), 2nd gear, Side stand Up, Neutral Light Off, ABS light On. Somehow I will have to read out the individual BIN data and make sense out of it.